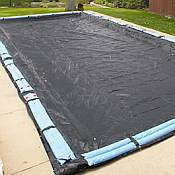 Fall is fast approaching, and the question right now is a swimming pool cover really worth it? The first thing to tink about is what a heavy load of leaves can do to a pool. In short and to be expanded on later, a heavy load of leaves can cause staining, chemical balance changes, clogged skimmer and pump baskets and lines, and let’s not forget the most important, more labor. So the easiest solution to the question of “to cover or not to cover” comes down to a simple equation…Swimming pool + Trees = Winter Cover.